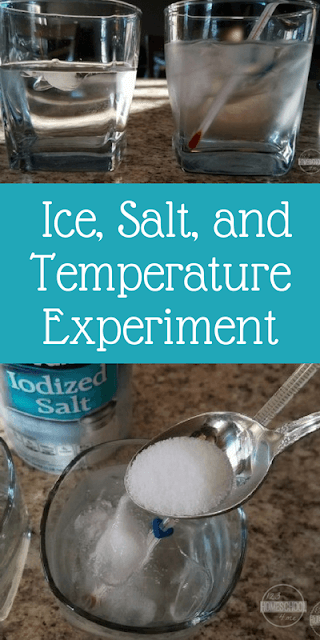 Help kids learn about the impact ice and salt have on temperature with this fun, easy science for kids. 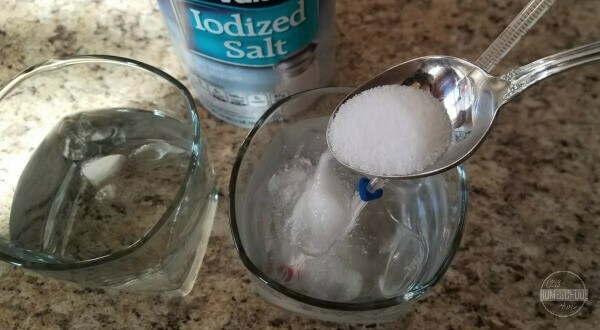 This Ice, Salt and Temperature Science for Kids is so simple to set up. When we want to make our drinks colder or to keep them cool, we add ice. No one likes warm lemonade or soda, right? Ice makes drinks colder because the temperature of the ice is lower than the temperature of most drinks. Water freezes at 32 degress Fahrenheit, so we know the temperature of the ice. If a drink is at room temperature, we know it is probably around 70 degrees F. If a drink has been in the refrigerator, we know that refrigerators are kept around 40 degrees F, so the drink will be around that temperature as well. If ice is 32 degrees and is placed in a room temperature drink, what temperature does the drink become? Will adding more ice make a difference? Is there a way to make the drink even colder without adding more ice? Let’s experiment. Let’s first see how the amount of ice affects the temperature of a drink. To make this experiment simple and easy to replicate, we will use water for our drink. Pour 1/2 cup water into each of the drinking glasses. 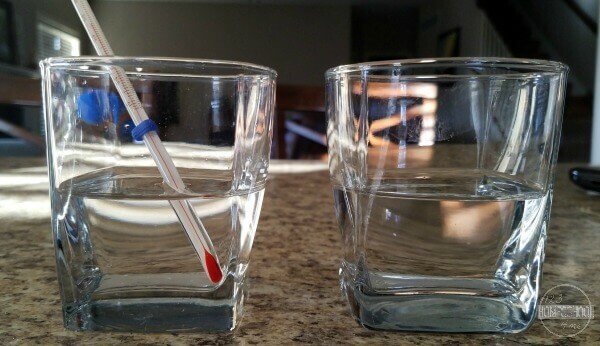 Record the temperature of each glass of water. Add one or two ice cubes to one of the glasses and place enough ice cubes into the other glass that it almost fills the water with ice. Give each glass is stir and let them set for 5 minutes. After 5 minutes, record the temperature of each glass. Keep recording the temperature every 2 minutes. At what point do you see the temperature remaining steady? When the temperature remains the same for 2 measurement times, move on to part two of the experiment. If not, keep recording every 2 minutes until the temperature stabilizes, then move on. In this part of the experiment, you are going to use the glass with the most ice added. (The water in this glass is probably going to have the lower temperature, as well.) Add a tablespoon of salt to the water and stir. Next, record the temperature of the water. Did the addition of the salt have an immediate effect on the water temperature? Check the temperature of the water every 2 minutes until it stays steady. In part one of our experiment, we wanted to see if the amount of water added to a drink (water) determined how cold the drink could get. The final recorded temperatures of the two glasses should have shown that the temperature in the glass with more ice was lower than the glass with just one or two ice cubes. 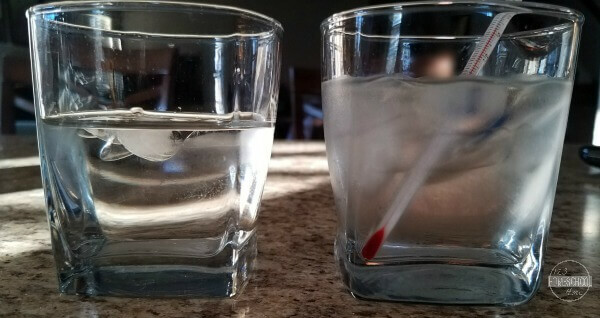 In fact, the ice in the glass with less added ice was probably melted by the end of the recording time. When the ice melted, there was nothing left to make the water colder. In the glass with more ice, the presence of ice continued to drop the temperature. 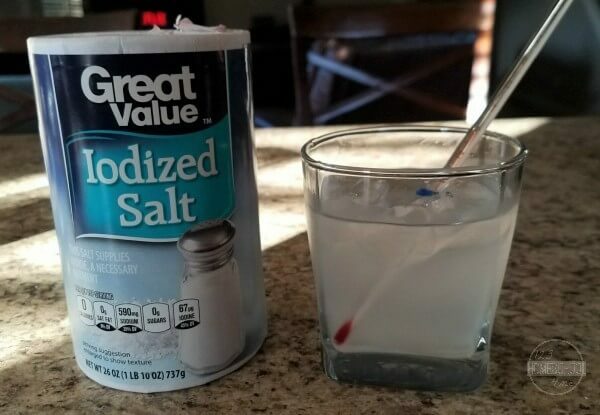 In part two of our experiment, we wanted to see if we could make the drink get even colder without adding more ice. When the salt was added to the cold water, the temperature dropped even more. Why? We know that fresh water (water without salt) freezes at 32 degrees F. When salt is added to water, the freezing point of water is lowered. This causes the ice to melt. Melting requires heat, which it takes from the ice and the water around it. This lowers the temperature of the water even below the freezing point of fresh water.